Even if you’re not in the market for a new TV, you might be wondering whether it’s time to change your TV service. Ads from cable, satellite, and phone companies promising more HD programming, improved picture quality, easy recording, and more could tempt you to upgrade your package or switch providers. Many TV-service providers boast of offering 100 to 150 HD channels, up from barely 20 channels a year or two ago. There’s no agreement on what constitutes a high-definition “channel,” so it’s hard to compare claims. Some providers classify each regional sports network feed as a channel, for example. It’s safe to say that all service providers have been adding more HD channels to remain competitive, but you’ll have to check to see what’s available in your market. The surge in HD is being driven largely by competition. As Verizon, AT&T, and others roll out fiber-optic networks that can handle TV, voice calls, and Internet access, more consumers have a choice of service providers. The telcos, as the phone companies are called, are expanding fast. Verizon was the top-scoring TV service provider of any type in a recent survey by the Consumer Reports National Research Center. Cable is accessible in most parts of the country except for some rural regions. About 98 percent of markets are served by a single cable company, so you probably have no choice if you want cable but don’t like your provider. Satellite service is available nationwide from DirecTV and Dish Network, provided you’re able to mount a dish antenna with an unobstructed view of the southern horizon. Fiber-optic availability is still limited, though Verizon and AT&T have been expanding steadily. Although telco TV has been growing city by city, many states have authorized statewide franchising to speed expansion. Cable service requires no contract, for the most part, and equipment is usually rented. To get high def, you’ll have to rent a high-def box. Monthly fees are typically the same as for standard-def gear: about $5 to $8 for an HD box or DVR, plus $10 to $16 for the DVR programming service. To get the best deal from a satellite or phone company, you often have to sign a 12-to-24-month service contract, with penalties for early cancellation. To address user concerns about cancellation fees, Verizon has added a month-to-month plan with no penalty for termination, plus a 30-day trial period during which new subscribers can cancel without penalty. 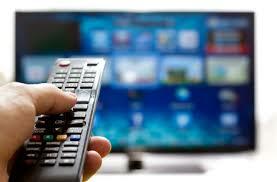 TV providers generally offer discounts on hardware or free equipment when you sign up. Consider how many TVs you want to hook up so you can determine your total equipment costs and programming fees (say, if you want DVR service on multiple sets). Virtually all providers carry the major broadcast networks in HD, plus HD versions of Discovery, ESPN, National Geographic, TNT, and Universal. Many sports channels, regional sports coverage, and sports packages from the NHL and NBA are widely available in HD. Both satellite providers, along with Verizon, Comcast, and many smaller cable companies, carry the NFL Network, with its exclusives on eight league games. If you’re a diehard football fan, DirecTV is still the way to go. It has an exclusive on NFL Sunday Ticket ($289 for about 200 games), plus Sunday Ticket SuperFan, a $99 add-on package that provides extra features, such as eight games on a single screen and game replays without commercials. DirecTV and several cable companies are now carrying the new Major League Baseball (MLB) Channel in HD, which Dish doesn’t offer. Cable has had the edge in video on demand (VOD)â€”movies and other programs, including high-def ones, that you can order, start, and stop whenever you want to within a 24-hour period. But other services are beginning to catch up. AT&T and Verizon have begun offering HD VOD and are working to expand their offerings. The satellite companies are trying to compete with “quasi” VOD. They download selected programming to your DVR, and you pay for it only if you view it. Be realistic about what you’ll watch so that you don’t pay for stations you’ll never tune in. All TV providers charge more for packages with more channels and premium networks. You’ll pay extra for HD service with the satellite companiesâ€”$10 a month for DirecTV, $20 a month for Dish. Recently, both satellite providers announced that they’ll start offering some movies in 1080p, though it’s not yet clear whether there will be a noticeable difference in picture quality. Most cable companies don’t add a surcharge for HD programming, but some do. Some HD channels you now get for free will move to optional HD “tiers” you have to pay extra to receive. We’ve generally found only modest price differences among providers for comparable packages. Regardless of provider, expanded basic programming with HD costs about $50 a month. You’ll pay closer to $75 for a fuller lineup including HD, and $100 or more for a package loaded with every available channel, including HD and premium channels such as HBO and Showtime. Don’t place too much weight on the sheer number of HD channels a service offers. Chances are that you regularly watch only a handful of channels anyway. Once most TV service providers are able to offer 100 to 150 HD channels, quality could become the most important differentiator among the services. In our survey, Verizon FiOS and satellite subscribers were generally more satisfied than digital-cable customers as a whole with picture and sound. Cable subscribers getting high-def were much more satisfied with picture and sound than those getting only standard-def, but even cableâ€™s high-def picture quality ratings didnâ€™t match scores for Verizon and satellite, which combined high-def and standard-def. Verizon also got top marks for customer service.